Sustainable Agriculture is the practice of farming produce that will contribute to the well being of the land and wider environment, whilst producing a substantial yield. Ideally, sustainable forms of farming will address food and nutrient shortages throughout the world whilst employing methods that produce low carbon emissions, in line with environmental policy in the UK. Currently, farmers practice sustainable agriculture as far as possible, in that all farmers wish to maximize the potential of their land, and perpetuate crop growth where possible. However, this does not always fall within the remit of a sustainable environmental policy, as intensive farming methods that consume large amounts of fossil fuel, pesticides and chemicals are still prevalent. There are three main traditional approaches to sustainable farming: 'monoculture' - the perpetual growth of the same crop on one piece of land; poly culture - the growth of several mutually supportive crops in one location at the same time; crop rotation - the rotation of several different crops across several fields, or the growth of several different crops in one field over successive years. Monoculture can be relatively low maintenance and cost effective as it involves the same farming techniques year on year. 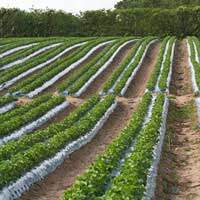 However, successive crops can be subject to quality deterioration as a given crop needs certain nutrients from the ground and over a period of years one crop will drain the soil of all the nutrients it needs. Polyculture is the least popular of the three methods, yet is the most environmentally sustainable. Crops are planted with a view to their mutual benefit. For example, a nearby crop that attracts a natural predator of aphids helps one crop that is infested with aphids. The need for pesticides is therefore eradicated. Polyculture is relatively high maintenance and low profit. Crop rotation can improve soil fertility as different crops drain the soil of different resources. It can also help to avoid the development of diseases that are specific to only one crop. All of these methods of farming are viable ways of sustaining produce, yet only one of them - polyculture, the least economically rewarding - is specifically addressed to the wider issue of environmental sustainability. Sustainable agriculture must be cost effective and profit driven, as well as environmentally friendly if it is to succeed. This will depend on the employment of new technologies that reduce the use of harmful chemicals and dependence on fossil fuels in conjunction with the best approach to choosing crops annually. To ensure that supplies reach consumers at reasonable prices. Notably, there is no mention of farming for the benefit of the environment. This highlights the difficulty of implementing a 'sustainable' agricultural policy: With 50% of Europe's land being farmed, ecologically sound farming procedures could stand to have a detrimental effect on the economy of agriculture-dependent nations and are not a priority for farmers from many EU countries. However it is precisely because 50% of Europe's land is farmed, that environmentally sound agricultural policies need to be developed. Climate change (linked to the emission of carbon dioxide) will have a radical effect on farming habits, whilst farming practice can be changed to slow dramatic climate shifts, through energy conversation. The EU has introduced 'agri-environmental' reforms to the CAP in recent years to encourage farmers to use sustainable methods. Under these schemes, the high cost of changing from conventional to sustainable farming is subsidised by the EU, under the proviso that the farmer will use sustainable farming methods for at least 5 years. No specific financial support will be given to farmers returning from sustainable methods to conventional ones. Over time already existing EU subsidies will be partly allocated on the basis of a farmers 'sustainability' record, with all farmers complying with a 'base level', and only those exceeding basic environmental criteria qualifying for extra money (a total 3-5% of the overall EU farm subsidy). These are positive steps yet, despite these measures, the CAP is overwhelmingly operated for the benefit of profit over environmental well-being. With countries still allowed to regulate their own farming industries (with regard to sustainability) there may be slow progress amongst countries that are agriculture dependent.